Kavanaugh’s Problem Isn’t What He Said in His Hearings. It’s Trump. As part of their long-shot fight to deny Brett Kavanaugh a pivotal seat on the Supreme Court, his progressive opponents are pointing out that he is one of the least popular SCOTUS nominees ever. A new survey from CNN shows 38 percent of respondents favoring his confirmation, 39 percent opposing it, and 23 percent with no opinion. That makes him less popular not only than pre-Trump SCOTUS nominees from both parties, but than Neil Gorsuch, who had a 49/36 ratio favoring his confirmation at an equivalent point in early 2017. So are anti-Kavanaugh activists justified in thinking that his record as reflected in his performance in the confirmation hearings are getting a thumbs-down from the public? Did millions of Americans watch the hearings and decide the man was committing perjury over Bush White House emails or decisively revealing an intention to overturn Roe v. Wade? Probably not. For one thing, Kavanaugh’s favorability ratio was slightly worse before the hearings, according to CNN. And the same poll showed uniformly negative (34/45) assessments of how Senate Democrats and Senate Republicans handled the hearings. It wasn’t a “win” for anybody, at least in the court of public opinion. So why the significant change between Gorsuch’s popularity and Kavanaugh’s? There’s a pretty simple explanation for at least some of the drop that doesn’t depend on the idea that regular folks are following confirmation hearings with a fine-tooth comb and SCOTUS blog: the president who appointed both men isn’t as popular as he was early in February 2017. On February 2, when CNN had Gorsuch at 49 percent, it had Trump’s approval rating at 44 percent. 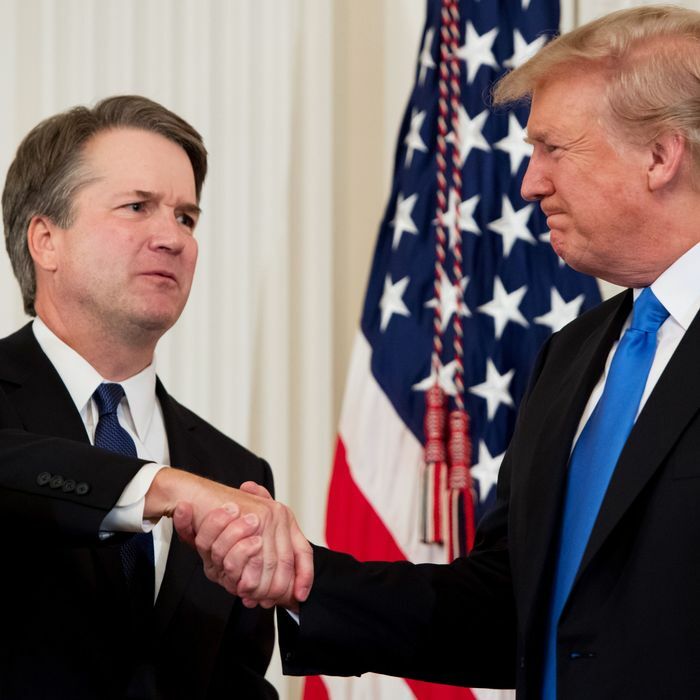 Most recently, CNN placed Trump’s approval rating at 36 percent, two points below Kavanaugh’s at 38 percent. Stands to reason that Trump’s SCOTUS selections, like so many other things in American politics, would borrow quite a bit of his public opinion assessments. That is not to say that the criticisms of Kavanaugh his critics have launched have no merit. While I don’t share the accusations of perjury against his Senate testimony, there’s no question in my mind that there is a long con going on in which a jurist dedicated to a constitutional counterrevolution is being elevated to the Supreme Court under a false flag of moderation. But I doubt the general public has figured out the games he and his supporters are playing, beyond a healthy suspicion of what a president like Donald Trump might do to the Constitution if given too much power to shape SCOTUS. Kavanaugh is mostly unpopular because his presidential benefactor is unpopular, and the GOP is apparently willing to take a lot of risks to support both of them. Kavanaugh’s Problem Isn’t His Testimony. It’s Trump.